I love breakfast. It IS the most important meal of the day, right? I remember as a little kids getting to go out to eat on trips to have breakfast and what an amazing difference it was having breakfast in a restaurant instead of at home. Cracker Barrel, Waffle House, Denny’s and IHOP were the choices I remember growing up, as well as the occasional McDonald’s Egg McMuffin, but now there are so many other great places to nosh at breakfast time, so I look for them. Last week I was in St. Louis for a conference and found a little place just south of town and it was wonderful. They even are so proud of the fact they are an “independent restauranteur” that they print that fact right on the front of their menu! They so focus on the food, they do not even have a website… but there are lots of places that list reviews or suggestions for it and most are great. Here is YELP‘s take. I did manage to find that they do have a Facebook page. My omelet was called the Spanish Dawn. It was big, fluffy and felt like there was 6 eggs in it… though I am assured it was just 3. The best part was the spicy chorizo sausage. Gave the omelet the kick it needed! The sour cream and guacamole helped cool that spice down and worked so well with the eggs. Plus the salsa and guac were made fresh and tasted great. 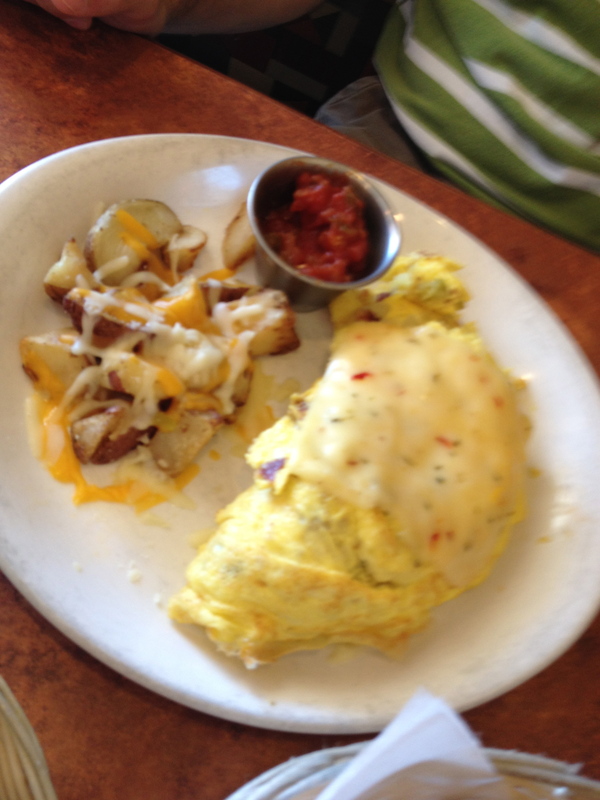 My friend got a southwest omelet which looked equally as savory with its pepper jack cheese on top! Service was great and the coffee was fantastic. Most local breakfast places like this do not ever seem to have good coffee. Theirs was very robust. They have good food, great service and hearty coffee which helps keep themselves going – even though 3 doors down is a “St. Louis Bread Company” chain store (like a Panera). One advantage they have over folks like Panera, is that they serve a full breakfast menu, not just bagels and eggs. 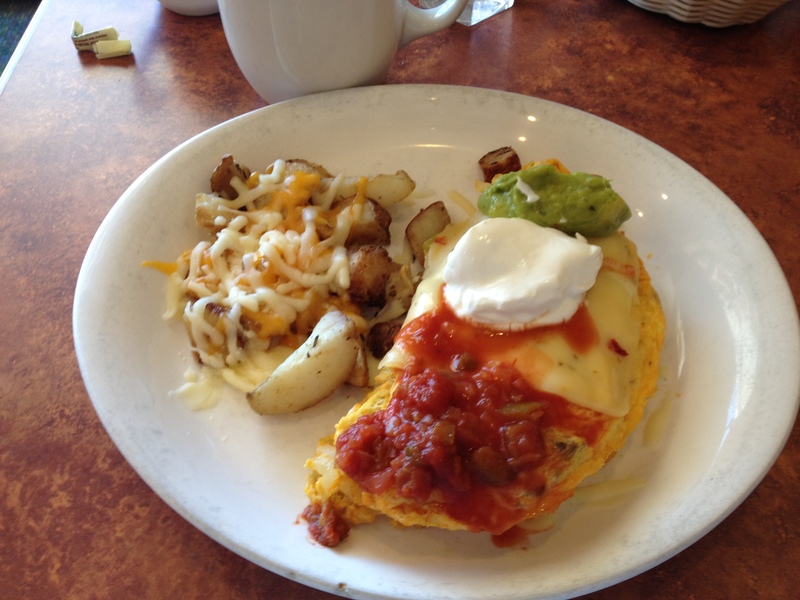 Everything from oatmeal to omelets, from pancakes/waffles to biscuits/gravy, from corned beef hash to steak & eggs. All you would want. (Even Cream of Wheat!) Another advantage they have over the competition is that they do not just serve breakfast, though with the name SUNRISE CAFE that may not be as obvious. They have a great selection of lunch & dinner options (sandwiches, soups, salads, burgers, fish, BBQ, ribs, steaks, etc) and even do appetizers and sinful deserts! Another great example of why we need to “break the chains”… eat LOCAL. It is just better. 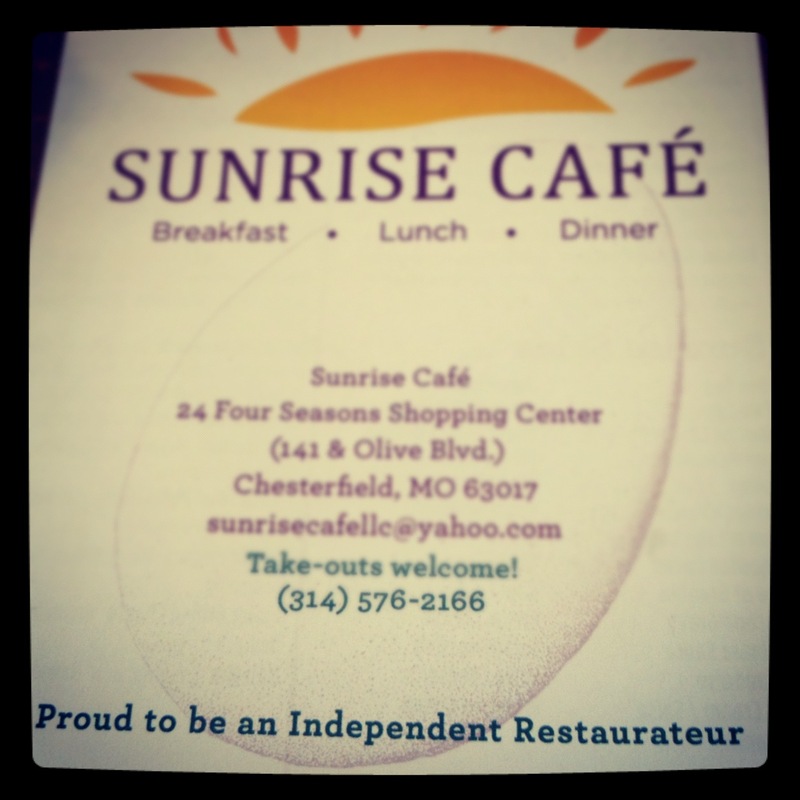 This entry was posted in picture, review and tagged breakfast, brunch, cafe, coffee, dad, dining, eat, family, food, Missouri, omelet, St. Louis, sunrise, sunrise cafe, travel by Jeff Cruz. Bookmark the permalink.